Coastal points of interest in this part of the state, readers, tend to have French names. There’s Cape Bouvard, Cape Naturaliste, Cape Leeuwin, Cape Clairault, Point D’Entrecastreaux and not forgeting Geographe Bay to name a few… well that would be most of them. The naming of these places indirectly lead to the settlement of Western Australia by the English. When the Governor of NSW in the young burgeoning settlement of Sydney town heard French explorers were snooping around the western end of the continent naming capes, reefs, bays, and having a merry time doing it (drinking French wine to boot), he dispatched a ship west to settle the place. And so HMS Amity made Albany in 1826, thus the British colony of Western Australia was established. 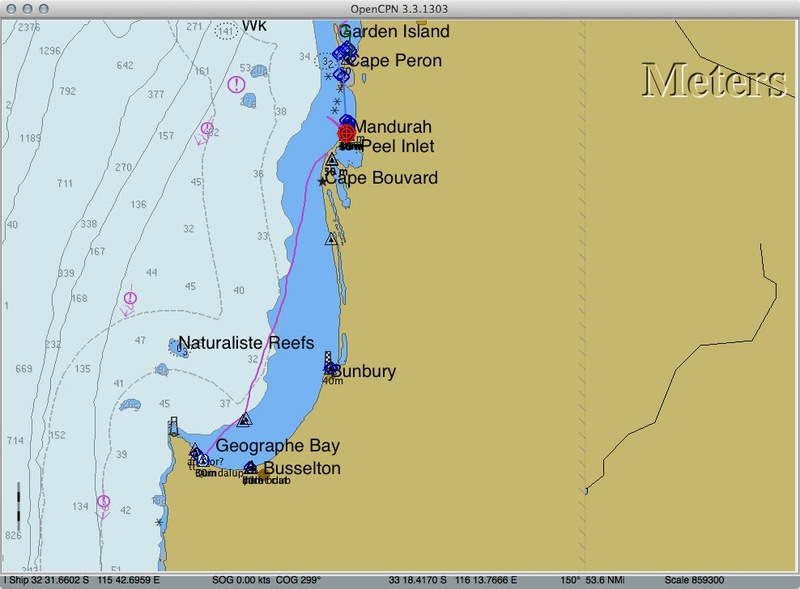 Geographe bay was our destination and initially we wanted to make Bunbury, a 50Nm trip. The boisterous easterly had given way to a light SE’er and by midday, after successive shaking out of reefs it was but a zephyr. We were still making way at 2.5 knots under a huge cloudless blue sky. The windvane, which surely must be sorted by now, having its power greatly increased, was still experiencing teething problems. 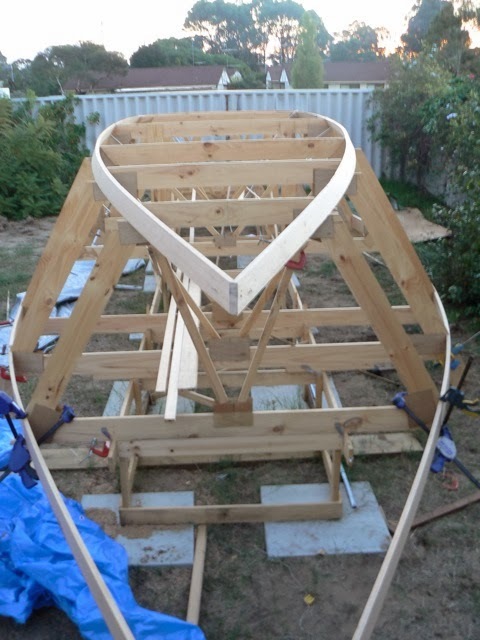 This time the lead counter weights were fouling the main sheet at that particular point of sail and the linkage design I used was not very efficient. Fortunately Ashiki sails to windward quite well with only the tiller lashed, so we did not need to sit in the cockpit the whole day. But I was spending much of the time fiddling with the vane. At one point, Susie mentioned there was another boat. “Eh! ?” She had been watching it come over the horizon and catching us. “WHAT!! ?” And there she was, a catamaran off the starboard quarter, gaining on us. Our sails still had another panel to shake out as we weren’t really trying. Raised them to full size, the cat of about 38’, sat out there 1/2 Nm offshore from us, not able to pull ahead for the next 2 hours with us soflty gliding to windward at 2 to 3 knots. Then suddenly they pulled way ahead and disappeared over the horizon. I guess they turned on the motor to keep to a schedule. But this was the second indication of Ashiki’s light wind performance. The first was 2 weeks ago when we caught and overhauled a 30+ yacht on a beam reach, again in light winds. We continued on over the smooth seas as the SE’er built a little, but it was looking like a night landfall in Bunbury. There’s one rule we made for ourselves and that is to never enter a new port or anchorage after dark. If we had prior experience of a port or anchorage in daylight, then a night entry is no problem, because we’d know where everything is. Since we can’t see the bottom in the dark, whether sand or weed, how do we anchor safely at night? So we made the decision to skip Bunbury and continue on to Quindalup, another 6 hours further down the coast. Of course this might bring us to that anchorage at 4am. Also too early. We’ll see how it pans out. On we sailed, making 3 to 4 knots through sunset. Susie made tuna sandwiches for dinner, washed down with icy cold soft drinks. 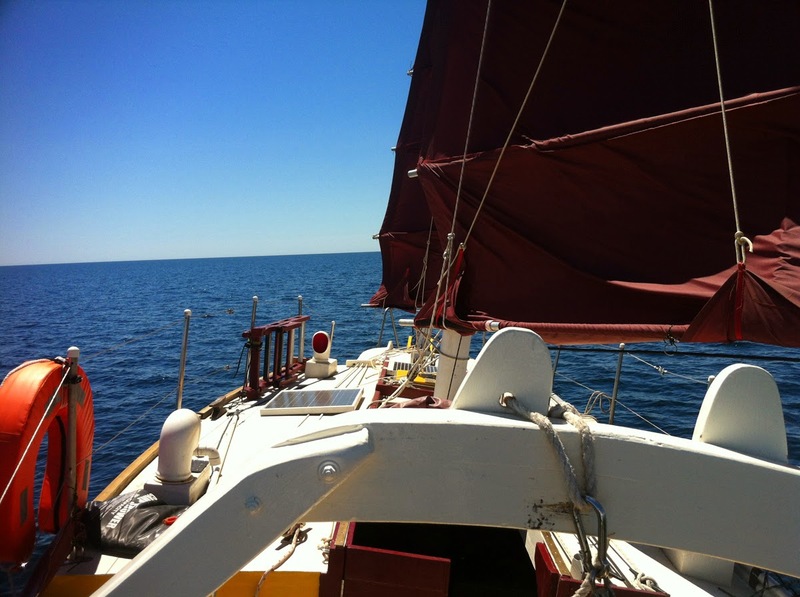 It was smooth sailing, we had the tiller lashed and Ashiki kept her course to windward. I used the pram hood for the first time at night. We took turns sleeping in the pilot berth and taking watch. It was a very easy leisurely sail, until around 10pm.